Click here to see how to prepare Holiday Fudge: 56k | 300k. Butter a 9x13 glass pan. Break two giant Hershey bars into small pieces and place in a large bowl. Consider refrigerating half of the chocolate ahead of time will help the fudge set quicker and make it more creamy. Add marshmallow creme to the chocolate. 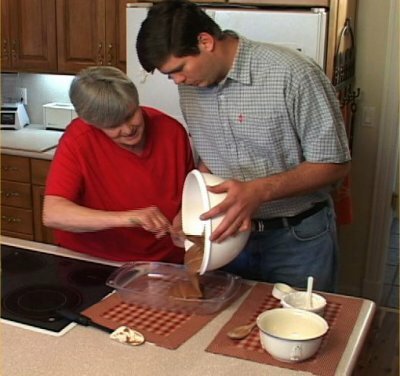 Next, put evaporated milk in a heavy pot first and then add sugar and butter. Cook over medium heat stirring regularly and bring to softball stage (220 degrees farenheit). Pour liquid over chocolate and marshmallow creme and then add vanilla. Stir until candy thickens and begins to lose its gloss. Add peanut butter, pecans, cashews, or walnuts at this point if you like. Pour into 9x13 pan and let sit until firm. Serve and enjoy!